Nell Gupton Battle along with Ruth Oliver Jeffreys were Rocky Mount’s first and second librarians. Mrs. Battle was Rocky Mount’s first and only librarian for 22 years. She advocated for and had built the first bookmobile to serve rural Nash County residents. She expressed her displeasure at the lack of library services “for the colored people of Rocky Mount”. Mrs. Battle was a fierce advocate for libraries and literacy until her retirement in 1943. Mrs. Jeffreys served as Braswell Library’s first Cataloger and Secretary from 1929 to 1944. She assumed the role of Head Librarian upon the retirement of Nell Battle. Mrs. Jeffreys provided library services to Rocky Mount citizens for 50 years. 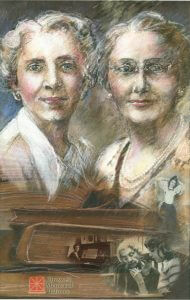 Together Nell Gupton Battle and Ruth Oliver Jeffreys provided library services to the community from 1921 thru 1979.